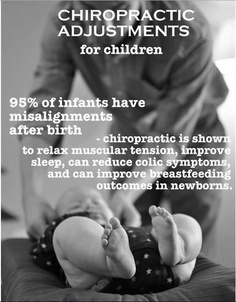 Chiropractic... Good for Mom and Baby! Chiropractic is widely known to be an effective treatment for general back pain, but did you know it is also beneficial for pregnant women? The mother’s body undergoes a myriad of changes during pregnancy to accommodate the growing baby and to prepare for giving birth. During pregnancy, it is even more vital than usual for the woman’s nervous system to be functioning properly to optimize the body most effectively. The sudden growth of the belly changes the woman’s posture. As the pelvis softens and spreads to accommodate the baby, it can become out of alignment. In some cases, this can affect the baby’s position making delivery more difficult or even lead to a c-section. Chiropractic care is safe throughout pregnancy. All chiropractors have been trained to treat pregnant women through the various stages of pregnancy. Dr. Townsend's techniques are modified as needed to provide the best results while keeping mom and baby safe and comfortable. If you are pregnant or planning to become pregnant, talk to us about how we can help you to have a healthy pregnancy with lower complications. A combination of proper exercise, stretches, and chiropractic care can help you enjoy the anticipation of your new baby without some of the concerns and pains often associated with pregnancy. Don't forget about baby! Is it safe for infants to get adjusted? Yes. Adverse events linked to pediatric chiropractic care are virtually nonexistent, estimated at 1 in 250 million pediatric visits. There is not a single medical procedure safer than that. We see lots of babies and kiddos in our office, and we love it! When adjusting a newborn, Dr. Townsend will only use the amount of pressure that you would use to comfortably push on your eye. The child gets checked by hand and with technology, then is placed in position (usually in Mommy’s lap or while being held), and gentle pressure is applied. That’s all there is to it. It’s simple, safe, and effective. Many parents have their children checked regularly by chiropractors as part of a healthy lifestyle to help them develop to their potential. Chiropractic is wonderful for the whole family! It's a safe, gentle, and effective way to address nerve dysfunction and promote overall wellness in the newborn and growing child.